Numerous plastic bags filled with sawdust and injected with liquid fungi hang neatly in rows from the ceiling waiting to be nurtured. Dark-brown wood ear mushrooms appear through slits in all kinds of curvatures waiting to be cut off, dried, cleaned, packaged, and sold. 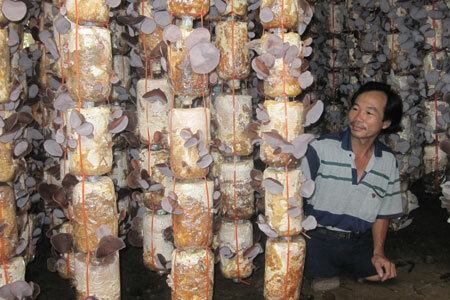 Do Thien Dang adroitly climbs up a wooden ladder to reach the bags at the top to water the mushrooms. Do Thien Dang, a landmine survivor, grows mushrooms in the north-central province of Quang Tri, one of the most mine-affected and poorest provinces in Vietnam. A project called ‘Mushrooms with a Mission,’ currently involving 100 families, enables victims of unexploded ordnance and their families to increase their income though mushroom farming. Photo by Anna Amin. It is a beautiful afternoon in the north-central province of Quang Tri, and the bright sunrays light up Dang’s dark eyes as his face cracks into a broad smile. A happy farmer, you might think, who profits from the fact that mushrooms are a very popular food in Vietnam. Happy he is, but Dang isn’t your average mushroom farmer; he is one of an estimated 2,000 victims every year of unexploded ordnance (UXO) in the country. Five years after the Vietnam War ended in 1975, he stepped on a landmine in Trieu Phong, Quang Tri Province, and lost both his legs. Today, despite his terrible accident, Dang is a successful mushroom farmer and happy because he can provide for his family. So what is it with the mushrooms? We all love to eat the nutritious delicacies, true, but there is something else to the story. More than simply appealing to our taste buds, the brown gold has numerous advantages that allows it to benefit our society on a much larger scale. In the case of Vietnam, mushroom cultivation has enabled victims of unexploded bombs to not only make a living and provide for their families but also to regain their self-confidence and pride, something that can’t be measured in terms of just money. In 2009 the Humpty Dumpty Institute (HDI) in the US partnered with RENEW, Vietnamese project, to expand a nascent mushroom farming initiative in Quang Tri which allowed UXO and landmine survivors and their families to earn additional incomes by cultivating mushrooms in or near their homes. Thirty six years after the war Quang Tri remains one of the most mine-affected provinces in Vietnam as well as one of the poorest. According to Vietnamese government reports, more than 100,000 people have been either killed or wounded by UXOs and landmines since 1975. In Quang Tri Province, a third of the victims have been children. The joint project called “Mushrooms with a Mission,” currently involving 100 families, is aimed at enabling UXO victims and their families to increase their income though mushroom farming, significantly contributing to the livelihood of affected families. Ralph Cwerman, president of the HDI, explains that his institute and RENEW provide eligible families with all the tools they need to carry out the work themselves to make the project sustainable. Small plastic bags are filled with sawdust and injected with mushroom spores. The bags have slits from which, two to three weeks later, mushrooms begin to emerge. The mushrooms are cut off and then dried in the sun, tasks that are performed by the farmers. Cwerman explains that the “Mushrooms with a Mission” program has two aspects which make it a somewhat unusual project. Firstly, HDI and RENEW buy the mushrooms directly from the farmers at slightly higher than the market price. Secondly, the mushrooms are taken to a processing center lent to the project by the Quang Tri provincial government where they are processed, packaged, and marketed in Vietnam. There are also plans to export the mushrooms to other countries in Asia, Australia, and ultimately to Europe and North America. 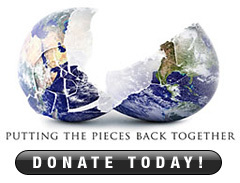 All the profits go into a fund to remove UXOs from Vietnam. So why are mushrooms the chosen tool in this assistance program rather than a vegetable, crop, or fruit? There are several answers to this question that demonstrate that mushrooms indeed possess a few “super” qualities. First of all they are easy to grow; mushroom cultivation doesn’t require machines or modern equipment. Since the process is fairly simple, the disabled people and their families can participate in mushroom cultivation, women and children can help, as it doesn’t require hard labor. Furthermore mushroom cultivation isn’t very time intensive, meaning it can be done during the family’s spare time or after work, providing a good source of additional income. Mushrooms are also more advantageous economically compared to other crops such as rice since they fetch a higher price, can be produced at a lower cost, and have a much shorter turnaround time. On top of all, mushrooms are highly nutritious and have always been a very popular food in Vietnam - a winner in all respects. “Mushrooms with a Mission” recently completed its second growing season, increasing output from about 1,000 kilograms of dried mushrooms a year to more than 3,000kg. Currently “Mushrooms with a Mission” mainly grow wood ear mushrooms, but shiitake, oyster, and the much-prized ganoderma or linchie mushrooms are on the way. Ganoderma are known for their medicinal properties and enjoy a reputation in the east of being the ultimate herbal substance. The HDI and Project RENEW see bright prospects for the future. The main objective of the program is to increase the number of mushroom farming families from 100 to 1,000 and turn Quang Tri, a barren and UXO contaminated province, into Vietnam’s main mushroom area. The institute is also looking at expanding the project into Laos, which holds the depressing record of being the most heavily bombed nation per capita in the world and has just recently begun a very small pilot program in the province of Khammoune. Cwerman says that in Laos mushrooms could be a viable substitute for opium, a recurrent and growing problem in the Golden Triangle. As for Vietnam, more funds are needed to increase the number of participating families and modernize production facilities. Current funding comes from the United States and Taiwan. More funding would allow the HDI to develop a hi-tech, organic mushroom farming industry to create a significant and stable source of employment for affected families in Quang Tri. The Project also calls for the establishment of a Center for the Collection and Storage of South East Asian Mushroom Cultures and to become a regional center for the collection and maintenance of wild and commercial isolates of economically important mushroom cultures. This would allow for long-term economic development in Southeast Asia and become a valuable resource for mushroom production worldwide. Existing culture storage capacity in most of SE Asia is based on older culture storage techniques and equipment. New technologies and equipment are now available to allow for more stable storage of mushroom cultures. In this way, the Center would act as a working showcase for other regional labs of this newer technology. This new Center would establish close working relationships with the major governmental and private culture collections in all interested SE Asian countries. The financial benefits to the farmers are obvious as mushroom cultivation demonstrates a suitable and sustainable solution for mine victims to provide for themselves and their families. It is also an extraordinary opportunity for people who otherwise have limited access to employment. It is not just the financial aspect of it though; it is also an issue of regaining pride and human dignity. Today, despite his disability, Dang is happy because he can provide for his family. Being able to do that gives him a sense of pride, a feeling of empowerment which, for a disabled person in one of the poorest regions in Vietnam, can only come from making an active contribution to his family and community. Just like Dang, many other mushroom farmers in Quang Tri have, for the first time in their lives, the opportunity to help and to make a difference. In Vietnam, mushrooms are saving lives, literally. And there is discussion among the project executives about expanding to include single mothers who head households and members of QuangTri’s vulnerable ethnic community, the Bru – Van Kieu. Much has been written about how mushrooms are helping to improve public health by serving as production platforms for safe biopharmaceuticals. And in Vietnam, “Mushrooms with a Mission” demonstrates how the fungi benefit the community by providing a sustainable source of income for people with serious disabilities. Cwerman adds that it is very likely mushrooms can be also be used to clean up toxic dioxin that leaked into the ground during the Vietnam War, a problem that has been virtually ignored by the US in the past but is now being confronted. The cleansing power of mushrooms is being investigated to remove the toxicity and improve the environment. Environment, community, economy... Mushrooms certainly benefit all of them.